Joey Barton hit the headlines on his Turf Moor return after netting the only goal of the game in Burnley's top flight win over Southampton. On his second home debut for the club, the midfielder scored within six minutes of his introduction having replaced Dean Marney in the 73rd minute. After Oriol Romeu upended George Boyd 20 yards from goal, Barton swept the ball under the wall and just out of the reach of Fraser Forster to extend his unbeaten record with the Clarets to 24 league games. With both Scott Arfield and Johann Berg Gudmundsson failing to shrug off injuries sustained in the FA Cup stalemate away at Sunderland, it was Steven Defour's duty to sit out on the left hand side of a four man midfield. Southampton showed midweek just how well-oiled a unit they are under the stewardship of Claude Puel when gaining the advantage over Liverpool at St Mary's in their two-legged EFL Cup semi-final. And they proved just as difficult to break down at Turf Moor as they stood resolute at the back, marshalled expertly by skipper Virgil Van Dijk, worked the ball well in the middle of the park while utilising the pace of Nathan Redmond and Shane Long to spring the counter. Stephen Ward had to be alert in the early stages when Redmond found space behind Matt Lowton down the left channel and whipped in a brilliant ball for Long who was denied by his Republic of Ireland team-mate. Burnley's front men were seeing very little of the ball in front of goal and it was down to defender Ben Mee to pose the threat. The centre-back's header dropped just wide of the upright as he rose to win Defour's corner before last season's players' player of the year guided a shot wide of the post after Ward's clearance fell kindly for him. Dusan Tadic was involved in everything the Saints crafted going forward and the Serbian went close to breaking the deadlock on a couple of occasions. The midfielder pulled a shot wide of the far post when picked out in space on the left hand side of the penalty area by Redmond. And then he saw his volley hacked off the line by Mee from a Cedric Soares delivery soon after. James Ward-Prowse also had a great chance to open the scoring but, in a similar mould to the save he made to deny Zlatan Ibrahimovic at Old Trafford, Tom Heaton made himself big to save the England Under 21 international's header. However, Southampton's contribution in the embryonic stages of the second stanza was predominantly percentage stuff. Other than Long's header in to the side-netting and Ryan Bertrand's volley straight at Heaton, the Clarets restricted the visitors. Record signing Jeff Hendrick rifled wide of the near post from the edge of the box as the hosts looked to put their stamp on the game while Fraser Forster was untroubled by Defour's delicate set-piece. Forster was made to work that bit harder to prevent the Belgian's next attempt from creeping in, however, when gathering the ball at the second attempt as his right-footed strike squirmed out of his grasp. Jay Rodriguez was then introduced to Turf Moor for the first time since his departure in 2012, replacing Tadic, but it was Barton's return that proved more significant. Having made the headlines for all the wrong reasons north of the border, embroiled in controversy in his short spell in the SPL with Rangers, the midfielder once again made the news for all the right reasons on his second league debut for the club. The 34-year-old made a vital interception to thwart Long within seconds of his introduction and then went on to score the match-winning goal. After Boyd was sent tumbling to the turf, Barton stepped up to place the resulting set-piece beneath the wall and in to the corner, adding to the prowess he demonstrated against Brentford and Preston North End. But it required a phenomenal double save from Heaton to preserve the points in the closing stages. The goalkeeper fell at full stretch to his left to keep Rodriguez's measured shot out before jumping up to block substitute Josh Sims's follow up at the foot of his post. 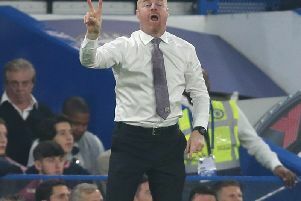 The victory, Burnley's eighth from 12 on home soil, the third best record in the division, moved them up to 10th in the Premier League.